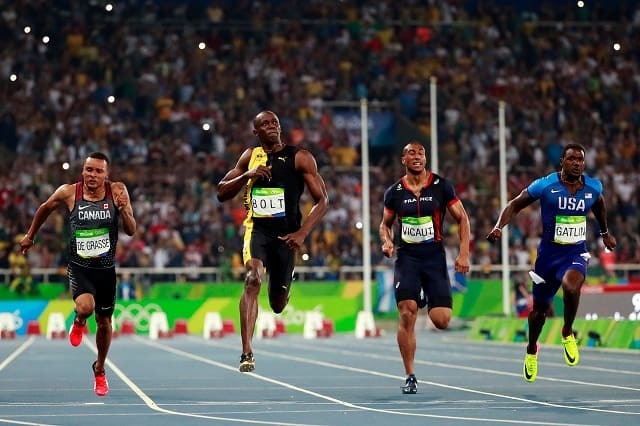 Usain Bolt for the 3rd Olympics in a row has come away as the fastest man in the world. The sprinting legend from Jamaica won the 100m in Rio in 9.81 seconds to go with his 9.69 seconds in Beijing in 2008 and his 9.63 seconds in London 2012. Usain has for a long time been a global superstar but after winning Olympic titles on three different continents he has truly graduated to legendary status being spoken about in the same breath as Mohamed Ali, Pele and Michael Jordan. As a Jamaican I am very proud of Usain, as a track and field fan, I am honoured to have witnessed his performances. He rose from a shy teenager from rural Jamaica to a globally recognisable man over the span of 15 years. Good job Bold! we look forward your 200m and 4×100 performances which are still to come in Rio.